ملک زاده, کرامت, آذرنیا, امیر حسین, ذوالقدر, ناصر. (1397). مدل تحلیلی برای پیش بینی پاسخ دینامیکی ورق ساندویچی با رویه FML تحت ضربه با سرعت پایین. علوم و فناوری کامپوزیت, 5(3), 331-342. کرامت ملک زاده; امیر حسین آذرنیا; ناصر ذوالقدر. "مدل تحلیلی برای پیش بینی پاسخ دینامیکی ورق ساندویچی با رویه FML تحت ضربه با سرعت پایین". علوم و فناوری کامپوزیت, 5, 3, 1397, 331-342. ملک زاده, کرامت, آذرنیا, امیر حسین, ذوالقدر, ناصر. (1397). 'مدل تحلیلی برای پیش بینی پاسخ دینامیکی ورق ساندویچی با رویه FML تحت ضربه با سرعت پایین', علوم و فناوری کامپوزیت, 5(3), pp. 331-342. ملک زاده, کرامت, آذرنیا, امیر حسین, ذوالقدر, ناصر. مدل تحلیلی برای پیش بینی پاسخ دینامیکی ورق ساندویچی با رویه FML تحت ضربه با سرعت پایین. علوم و فناوری کامپوزیت, 1397; 5(3): 331-342. در این مقاله پاسخ ورق ساندویچی با رویه الیاف–فلز تحت ضربه سرعت پایین توسط ضربه زننده صلب استوانه ای، براساس قانون برخورد اصلاح شده بررسی شده است.ورق ساندویچی از رویه های فلز-الیاف با یک هسته صلب –پلاستیک در نظر گرفته شده است.مقاومت له شدگی هسته در جهت عمودی ثابت فرض می شود. با استفاده از اصل انرژی پتانسیل مینیمم و مدل بالانس انرژی، یک حل تحلیلی جهت دستیابی به پارامترهای مجهول تماس در قانون برخورد غیر خطی هرتز ارائه گردیده است.در روش مذکور، ماکزیمم نیروی برخورد با کمک مدل جرم و فنر دو درجه آزادی در یک فرایند تکرار بدست می آید. باکمک این شیوه، محدوده معتبری، جهت استفاده از قانون هرتز برای ورق‌های ساندویچی با رویه الیاف-فلز تحت ضربه سرعت پایین، ارائه می گردد. قانون برخورد اصلاح شده نشان می‌دهد که برای هر مسئله برخورد مقادیر ضرایب در قانون تماس، منحصربه‌فرد می باشد. نتایج بدست آمده از این روش، تطابق خوبی با دیگر نتایج تجربی و تحلیلی دارد. نتایج نشان می دهد که برخی پارامترهای فیزیکی و هندسی از قبیل چیدمان لایه ها، جرم و سرعت ضربه زننده در سطح انرژی ثابت و ابعاد سازه هدف، فاکتورهای مهمی هستندکه در پاسخ دینامیکی ورق ساندویچی با رویه فلز-الیاف اثرگذار می باشند. This paper presents a new analytical method for low velocity impact on sandwich plates with Fiber Metal Laminate (FML) face sheets subjected to static indentation of a blunt end cylindrical indenter. The sandwich plate was composed of laminated face sheets and a rigid–plastic core. The core-crushing strength in the vertical direction was assumed constant. In this method, using of principle of minimum potential energy and the use of energy-balance model between indenter and sandwich plate, contact unknown coefficients corresponding with Hertizian contact law are obtained. The elastic strain energy resulting from bending in the sandwich plate and external work due to indentation load are evaluated using an appropriate shape function for the sandwich plate deformation. The maximum contact force using two-degree-of-freedom(2DOF) spring-mass model was found through an iterative process. Limitation of using Hertzian contact law for sandwich plates is determined. The results are in good agreement with the experimental and numerical results. 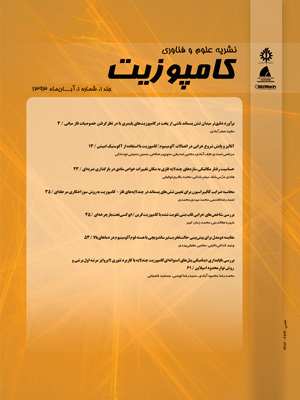 The results indicated that some of parameters such as the layer sequence, mass and velocity of impactor in a constant impact energy level and aspect ratio of sandwich plate are important factors affecting the dynamics response of the sandwich panel..
Volt, A., "Impact Lading on Fiber Metal Laminates" Journal Impact Engineering, Vol. 18, No. 3, pp. 291-307, 1996. Abrate, S., "Impact on Laminated Composite Materials" Applied Mechanics, Vol. 44, pp. 155-190, 1991. Williamson, JE. Lagace, PA., "Response Mechanism in the Impact of Graphite/Epoxy Honeycomb Sandwich Panels" In:Proceeding of the Eighth ASC Technical Conference, Claveland, OH, pp. 287-297, 1993. Ambour, D. R. and Cruz, J. R., "Low-Speed Impact Response Characteristics of Composite Sandwich Panels," AIAA-95-1460-CP, pp. 2681-2695, 1995. Pierson M. O. and Vaziri, R., "Analytical Solution for Low-Velocity Impact Response of Composite Plates" AIAA, Vol. 8, pp. 1633-1640, 1996. Olsson, R., "Mass Criterion Wave Controlled Impact Sponse of Composite Plates" Composite, Part A, Vol. 31, pp. 879-887, 2000. Hoo Fatt M. S and Park, K, S., "Dynamic Models for Low-Velocity Impact Damage of Composite Sandwich Panels-Part A: Deformation" Composite Structure, Vol. 52, pp. 335-351, 2001. Choi I. H. and Lim, C. H., "Low Velocity Impact Analysis of Composite Laminates using Linearized Contact Law" Composite structures, Vol. 66, pp. 125-132, 2004. Caprino, G. A. Spataro, G., "Low-Velocity Impact Behaviour of Fibreglass–Aluminium Laminates" Composites: Part A, Vol. 35, pp. 605-616, 2004. Chai, G. B. and Zhu, S., "A Review of Low-Velocity Impact on Sandwich Structures, Proceedings of the Institution of Mechanical Engineer" Materials Design and Applications Part L, pp. 207-225, 2011. Abdulla, M. R. Cantwell, W. J., "The Impact Resistance of Polypropylene-Based Fibre–Metal Laminates" Composites Science and Technology, Vol. 66, pp. 1682-1693, 2006. Numerical Modeling of the Impact Response of Fiber-Metal Laminates, Department of Engineering, University of Liverpool, Brownlow Street, Liverpool L69 3GQ, UK, Polymer Composite, 2008. Payeganeh, G. H. Ghasemi, F. A. Malekzadeh K., " Dynamic Response of Fiber Metal Laminates (FMLs) Subjected to Low-Velocity Impact" Thin-Walled Structures, Vol. 48, pp. 62-70, 2010. Hossini, M. Khalili, M. R. and Malekzadeh, K., "Indentation Analysis of In-Plane Prestress Composite Sandwich Plates: An Improved Contact Law" Key Engineering Materials, Vols. 471-472, pp. 1159-1164, 2011. Shokrieh, M. M. Fakhar, M. N., "Experimental, Analytical and Numerical Studies of Composite-Sandwich Panels Under Low Velocity Ompact Loading" Mech compos Mater, Vol. 47, No. 6, pp. 643-658, 2012. Morinière, F.D. Alderliesten, R. C. Sadighi, M. Benedictus, R., " An Integrated Study on the Low-Velocity Impact Response of the GLARE Fibre-Metal Laminate" Composite Structures, Vol. 100, pp. 89-103, 2013. Guo-Cai, Yu. Lin-Zhi, Wu. Li, Ma. Jian, Xiong., "Low Velocity Impact of Carbon Fiber Aluminum Laminates" Composite structure, Vol. 119, pp. 757-766, 2015. Sun, C. T. Chen, J. K., "On the Impact of Initally Stressed Composite Laminates" journal of composite materials, Vol. 19, pp. 490-503, 1985. Malekzadeh, K. Khalili, M. R. Olsson, R. and Jafari, A., "Higher-Order Dynamic Response of Composite Sandwich Panels with Flexible Core under Simultaneous Low-Velocity Impacts of Multiple Small Masses" International Journal of Solids and Structures, Vol. 43, pp. 6667-6687, 2006. Liou, W. W., "Contact Laws of Carbon/Epoxy Laminated Composite plates" Journal of Reinforced plastics and composites, Vol. 16, pp. 155-66, 1997.